Safariland 6004 Tactical Gear System SLS Holster FREE SHIPPING! The Safariland 6004 tactical holster features the SLS rotating hood system which is so well suited for the tactical situations encountered today by police and military personell. Since there is no snap, the tactical 6004 holster allows for a smoother single-motion draw and greater protection against attempted weapon takeaways and provides reliability in the unpredictable conditions that occur during tactical operations. The hood on the 6004 holster can only be released by being simultaneously pushed down and rotated forward and actually becomes more secure when upward force is applied. The Tactical Finish of the Safariland 6004 holster is rugged, protecting the gun in scrape, scratch and dent incidents. Molded sight track and soft orthopedic suede protect the gun's sights and finish. 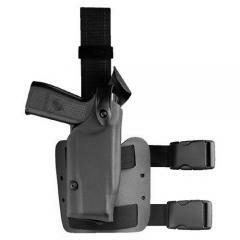 A special feature of the Safariland 6004 tactical holster is the double leg strap and the leg shroud. The 6004 Safariland holster is also available in brown flat dark earth and foliage green. Quality fit and function as usual from Safariland. ©2002-2019 CopsPlus.com: Safariland 6004 Tactical Gear System SLS Holster FREE SHIPPING!